After last week’s instructional video that went over how to read aviation weather (METAR & TAF), we received a bunch of questions asking what some good aviation weather sources are. In this video, I go over my favourites on the web, iOS, and Mac desktop. Before we begin, be sure to snag a copy of our free aviation weather cheatsheet for a quick reference to the upcoming training on aviation weather sources. No matter what kind of device or operating system you’re on, you can always look up the aviation weather for the area that you’d like via the web based system at the Aviation Weather Center. Once you’ve navigated over to the Aviation Weather Center, you can simply type in the airport / weather station code into the “ID” box under “Request METAR data”, and you’ll be presented with the METAR, and optionally the TAF for that location. To enable the TAF, simply click the checkbox on the next page that says “Included TAF” (circled in red below). You can also use this site to see the last couple of METAR to see the weather trend. On the results page, select the drop down that says “most recent only” (circled in green above), and choose how many hours you’d like to go back. The benefit of being able to look back is that you can see the weather trend in an area. The METAR might look great right now, but looking back an hour or two you can see that it’s been terrible and has only recently improved, so that may make you want to wait a bit before taking your drone out for a flight. Lakehorn has developed a desktop version of their popular iOS weather apps, called AeroWeather for Mac. This app is great as it sits right in your OSX toolbar at the top of your screen, and can be easily accessed with a single click. 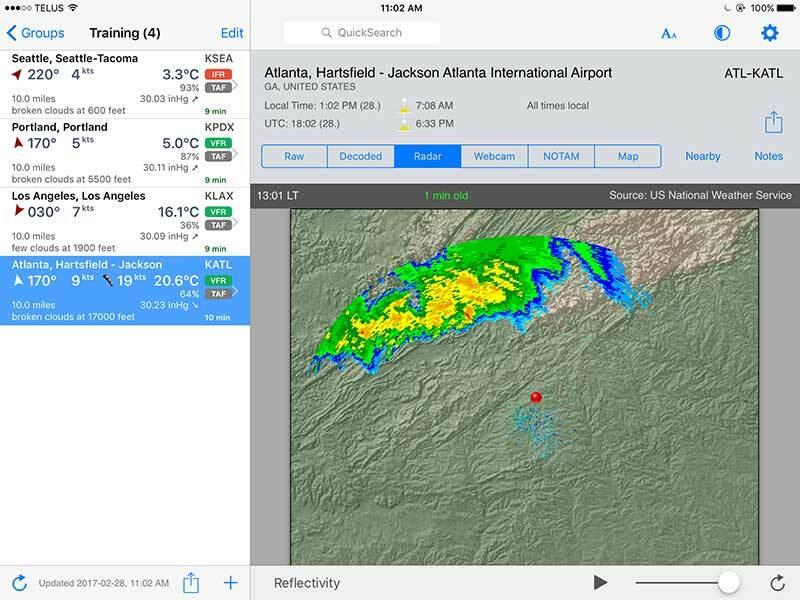 You can add an unlimited number of airports and weather stations, and view the data in your format of choice. The screenshot to the left is showing the aviation weather METAR and TAF for Atlanta in “Decoded” format, but you can easily click on “Raw” to have the data switch back to a raw format. Again, the way you choose to read aviation weather is up to you. Some find it easier to read the weather in Raw, and others like the read it in Decoded. You can also sort your list of stations manually, or by using one of the built in sorting options of ICAO, IATA, Name, or Country. Once you have your stations set up the way you want it, and want to share that aviation weather data with someone, it’s as easy as clicking on the share icon which will allow you to email, airdrop, social media share, etc. This app is full featured, fast, and easy to use if you’re on a Mac, running OSX 10.10 or later. AeroWether is available for $3.99 in the Mac App Store. Our favourite iOS app is AeroWeather, which is available for both iPad and iPhone. This app has been my go to for the past couple of years, as it’s fast loading, and is always available in the palm of my hand. AeroWeather for iOS is just as customizable as the desktop version, but also adds a few nice features as having one touch access to weather radar, webcams, and NOTAM for the area. This app has been my go to for the last few years, and I’m really loving the Pro version of the app. There is a free version available as well that will show you the raw and decoded weather, but for the ability to group, and see additional info such as radar, webcams, NOTAM, as well as airport charts and VFR Sectionals / IFR Low charts, AeroWeather Pro is definitely going to be your choice. AeroWeather Pro is available on the app store for $3.99. Now that you have learned how to read aviation weather and chosen your best aviation weather sources from the info I’ve provided here, may as well get out there and start flying! Be sure to log your flight hours in our free log book, and if you need a primer on how to fly your drone safely, we’ve also got a free training course just for you.